Did You Know that our chamber can provide you with a relocation packet - FREE OF CHARGE, packed full of information on our great city? 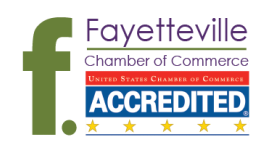 It comes complete with maps, things to do, places that are a must see when coming to Fayetteville, just about anything you want to know is included! Simply send us a request below and be sure to fill in your mailing address in the comment area and we will mail you a relocation packet. You may also download the Fayetteville AR Connect mobile app on your iphone or android to be informed of all things happening in Fayetteville and the NWA region. The app will give you information on events happening in the area, where to eat and drink; stay; and shop; news and weather; info about our schools and U of Arkansas, outdoor recreation, health, real estate and business services.